If you follow Mystery Point Road past the ruin mentioned in the previous post you come to Manitou Station. This has to be the smallest station I’ve ever come across. According to my very approximate measurements the platforms are about 23 feet long. My first thought was “What famous/powerful person lives here who has enough clout to have a station to himself?” But apparently I thought wrong. Manitou /mænɪtoʊ/ is a limited service Metro-North Railroad station. The station is open part-time, serving one peak hour (weekday) train in each direction, and six weekend trains each direction. It serves the residents of that hamlet in the southwestern corner of Philipstown, New York in Putnam County, New York, via the Hudson Line. It is 46 miles (74 km) from Grand Central Terminal and travel time to Grand Central is approximately one hour, 16 minutes. 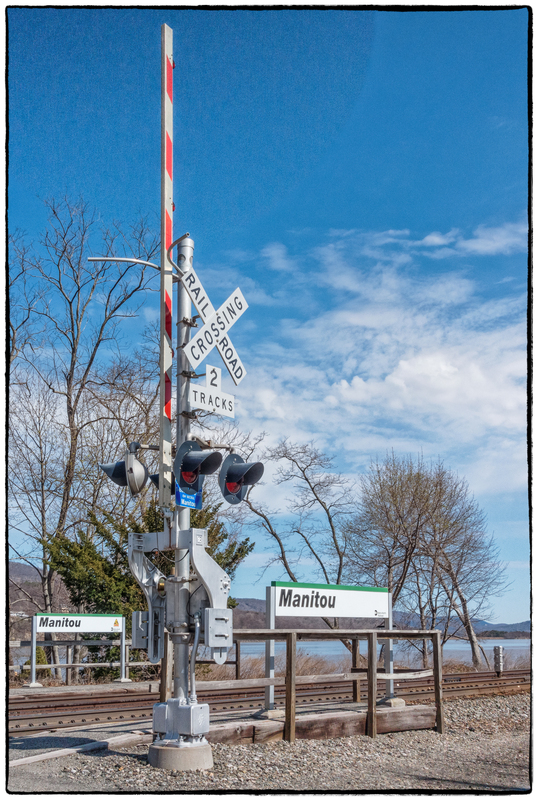 Manitou is one of three stations – along with Breakneck Ridge on the Hudson Line and Appalachian Trail on the Harlem Line – that receives limited passenger service. Like these stations, it serves mainly hikers visiting nearby state parks in the Hudson Highlands. There is no elevated platform or facilities at the station, one of two on the line adjacent to a grade crossing, are limited to a small shelter with the current schedule posted inside. The station predates the merger of New York Central and Pennsylvania Railroads.